What are Wacktrap Invitations and how do I send one? 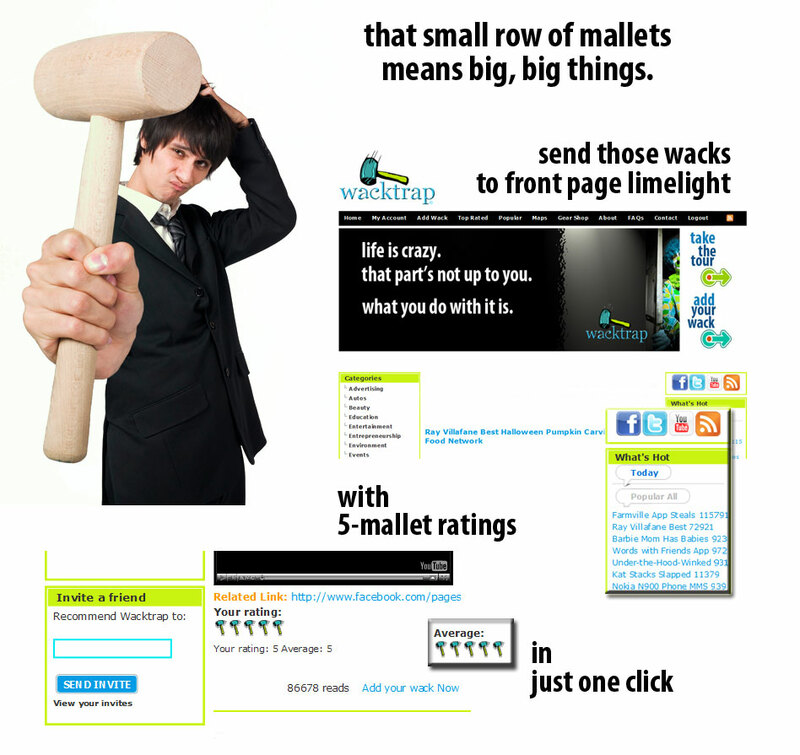 You're sharing your wacks with friends quickly and easily. But what if you also want your friends to be able to share their wacks, and make 'em part of your Connections? After all, it’s even more fun to see your friends’ crazy experiences too. If your friends deem you ‘in the know’ on all the latest, help ‘em out by spreading the word. When you're the 'go to,' don't leave 'em in the dark. You'll also rack up Wack Stats fast by inviting friends-and receive bonus Stats when your friends join Wacktrap. You’re lovin’ Wacktrap and wanna spread the word. But you also want to make sure you’re not unknowingly adding your best friend’s email address to a list of streaming solicitations. That just wouldn’t be cool. At Wacktrap, we make sure we're adding to your rep, not making you the resident fool. Wacktrap Invitations is a handy feature designed to make life easy-and communication fast. You can invite friends, family or anyone in your exclusive circle, to join the Wacktrap community. And because we've made a solid pledge to you, you'll rest assured we're not violating your privacy or theirs. Our Invitations feature makes joining Wacktrap a snap. Your friends will become part of your community-fast and easy-so they can post wacks right alongside yours. Make it a race to see whose wacks make it the Wacktrap homepage first-unless of course you're afraid of a little friendly competition. When they click that link, we’ll take ‘em where they need to go-straightaway. And you've helped 'em get there. For every friend that joins, we’ll be awardin’ you those bonus Wack Stats. But that’s just between us. We won’t share your secret. I want to send a message to another user. Can the user see my information? Just like you can’t see the personal info of the Wacktrap member you’re contacting, or wooing to make that Connection, we're similarly keepin' your info under wraps. Totally private. We're loyal that way, and there's nothin' additional you need to do maintain that level. No need to check a box, or mark a preference, in your Wacktrap account to ensure continued privacy. Can I post wacks, Rate wacks, and Comment daily? We see most of you daily. Sometimes several times per day. And that's the way we like it. We're a tight-knit community here. Wacktrap members not only want to hear from you, they're waiting for you to become part of that community. I want to share a wack in my Facebook Profile. How do I do it easily? Want to add your wack to your Facebook profile or tweet that wack instantly? You owe it to that inner circle to keep 'em up-to-date. After all, what would they do without you? We know you spend time on other sites, so we won't make you choose a favorite. We've made it easy to incorporate your wack, or share any wack you see, with your favorite friends and sites, in just clicks. How do I contact another user through Wacktrap Messaging? At Wacktrap, you have the freedom to communicate. Free and easy. Any time you see another Wacktrap member’s username in a wack, wack Rating, Comment or Forum post, you’ll be able to contact the member directly and privately. You're sharing your wacks with friends quickly and easily. But what if you also want your friends to be able to share their wacks, and make 'em part of your Connections? After all, it’s even more fun to see your friends’ crazy experiences too. If your friends deem you ‘in the know’ on all the latest, help ‘em out by spreading the word. When you're the 'go to,' don't leave 'em in the dark. Wacktrap Connections are always at your fingertips. You're gonna make lots of 'em here and we keep 'em all in one, safe place. Click the 'My Account' tab, and you'll find 'My Connections' directly above your personal Scratchpad. We make it easy to keep track of who's who, with a thumbnail avatar for every Connection you've got.